Sometimes I get seriously wrapped up in my everyday expenses. How can I spend less? How can I optimize my happiness while edging out my consumerism? These are pressing questions for me each and everyday. Then every once in a while all my big expenses occur in one month and I tend to want to freak out. What do I do? 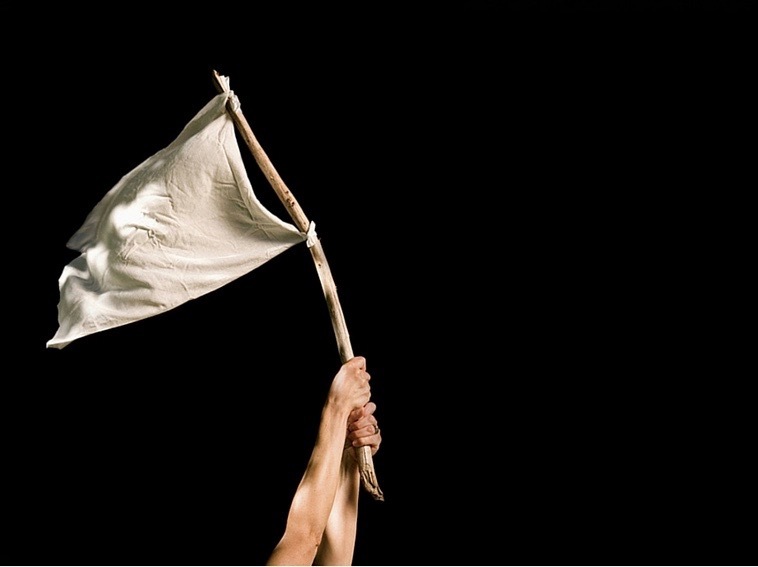 I surrender. When I took control of my financial life I went through a surrender of sorts. We think of surrender as a giving up and giving in, but in this sense it was relinquishing my old ideas about money and taking on an entirely new relationship with money. I write often about the relation of money to control. Having money equals security and power, whereas not having money equals instability and uncertainty. Frugal people know how empowering it is to have lots of money saved and not feel lost in a black hole of debt. Spending money can either make you feel empowered or it can make you feel out of control, it all depends on your perception. I used to be very much concerned with what I thought I needed. Separating “I need this” from “I want this” has to be one of the most empowering ways I changed my mind about money. When I embraced this surrender a lot of things I thought I needed dropped away and I was free to spend my money on things that truly improved my well being instead of things I thought would make me happy. I still spend money on plenty of things these days— the difference is I don’t feel like money is being stolen from me through monthly subscriptions or pointless payouts like loan interest. My money can go towards my interests, travel experiences, and necessities. The trouble is, necessities can seem like luxuries when they cost a lot. As a frugality nerd I’m always asking myself “do I really need this?” For the most part these days the answer is yes. I’ve done a wonderful job of cleaning up my spending habits and I’m mostly left with what’s necessary. So just as I originally surrendered to how I thought about money, today I surrender to things that have to be paid. My big expenses seem to all happen at once. This month I paid $700 for six months of car insurance, $700 for new tires, $300 to find out the dog has liver cancer, and $250 for six months of cell service. This spending is effectively 380% of my usual monthly spending. Yikes! I want to mention that expenses usually aren’t terribly regular or even predictable. This is exactly why we figure out a monthly budget by averaging out yearly spending over months. My car insurance costs $1400 a year so my monthly budget allowance towards car insurance is $116. This is a great way for me to see what I actually spend vs. what I think I spend per month. I simply don’t think about those expenses that come up once a year. My spreadsheet keeps me in check. For a cheapskate like me that 380% can hurt. Anytime I see money going out a little voice inside my head says “excess!” “spending!” “wastefulness!” These sorts of thoughts are completely useless. When you have necessary expenses you just have to pay them and dwelling on necessary expenses just fills up my brain with fear. When I’m a tightwad with money I manifest the same power struggle I had with money back when debt ruled my life. So what do I do? I surrender. These days I always have the money to pay for what I need and I’m privileged to pay the bills. I want to make the distinction that there’s a big difference between surrender and denial. Denial is not wanting to look at the credit card balance. Denial is not paying attention to your spending because really, you’ll have time to save later. A financial surrender is being aware of your financial truth and not giving into fear and anxiety. Any decisions or attitudes that come from a place of fear are not going to turn out well. Instead, you face your finances in spite of fear. A financial surrender is the best way I know to combat the classic money struggle. Money saving always comes back to controlling what gets spent. Trying to control anything, including money, is a fruitless pursuit. If you do succeed you will most likely come out at the other end pretty wrecked and anxious. Of course to be financially fit you have to reform your money spending and learn how to save, however you don’t have to do it worried, concerned, or anxious. I come at my finances from a calm place. I breathe, relinquish my fears about controlling every cent, and I make good choices. It’s through many financial surrenders that I’ve saved, and will continue to save, many thousands. I hope all my readers follow my path. As you astutely note, to get to the point where you are in control of your money, increasing your security, power, and breadth of choices, you have to be deliberate in developing a thoughtful financial plan, let go of long held fears, and make good choices. Enjoyed the read, my friend. It seems like I always come back to the fact that being financially smart comes back to your attitude about money. That includes handling necessary expenses when they come. What a great post Elsie. And so true. It’s amazing how that little ping of stress you get when you have to spend money on expenses. Even a $90 trip to the grocery store, I wince every time. Why?! That is what we are earning money for – to eat and stay alive! That feeling is always so compounded by those irregular expenses, good or bad- insurance, a vacation, root canal. They all register that same mental stress. (And I’m so sorry about your dog) : ( But you are right – these are the things we accept as the cost of living. Once you get to a place where you are able to pay for them without credit cards, there is no reason to mourn every penny. It’s a pointless waste of the great mood you should always be in once you are debt free! I feel the same way about my grocery bill. Somehow I always want to find a way to live without food…sadly, that’s not going to happen. I think if you have the mindset of being aware of every penny going out then you’re on the right track. We just have to work on not letting the necessities bother us and enjoy the financial peace we’ve all been working so hard for. I’ve really enjoyed reading your writing Linda thanks for the comment. I do the same thing when it comes to big expenses. I try and save a little bit every month so when they come due, they don’t hurt nearly as much! It’s tricky to get used to doing it but it’s well worth it when the rush of expenses come all at once for sure. When I have months like that, my wife always says to me “this is what we prepare for”. We also average out our yearly expenses into a monthly budget. I have a tendency to think when we haven’t allocated 100% of our income for the month that we have extra money, but really that’s the money that may go to the insurance bill that hits next month. And then when that expense heavy month comes, there is that little feeling of panic. But it’s not a problem, it’s what we prepared for. I relate to that feeling of panic for sure. It’s something that’ll probably never go away. Sounds like your wife is a smart woman Gary. I think you should make those shirts, Alyssa. They’d sell. Mr. Money Mustache wrote not too long ago that the #1 thing he’d tell his younger self is not to worry so much about money. Once you get good at saving you sort of go on autopilot with making consistent good decisions. I think a lot of us frugal people, especially in the blogging world, need to chill and accept expenses more than we do. Thanks for the thoughts! I agree so much with the pride thing. It’s tough to not fall in the trap of having luxuries to match your neighbors or your family. At an earlier age it’s easier because no one’s built wealth yet. I’m finding as I get older that the lure of material stuff is greater. Not only from inside myself in wanting to have nice things but from society telling me I deserve them. The truth is, the life I want to live is one of freedom and peace. I don’t want to get to the end of life and have a nice pile of meaningless stuff to look at. More often than not, despite always being a Frugality Master (coming from where I come from) and finally having enough money and then some to enter FI, I still can’t let go of control and surrender. What drives my DH nuts. Hopefully soon? I don’t really freak out when unexpected expenses come, but despite always having set money aside for such, I still feel the need to curb more to “cover” it. Good post with food for thought. I think good money savers have a tendency to go overboard when it comes to money being spent. It gives us a lot of pleasure to know we aren’t spending money so when we are, we feel a bit uneasy. I never thought of it as “financial surrender” but I guess that’s what we did. We don’t think about saving and spending the same way. We just think about living on our terms. That means we only buy what we need or absolutely want (the list is small on that side of the equation). That’s lead us to save more now than when we were making significantly more money. Our savings rate the last two years were 50%+ of gross income and with much less effort and thought than saving used to take. Interesting to see it described so differently. I like it! I think people who read personal finance blogs are all sort of going in the same direction, yet we all have a little different way of describing it. For years I’ve been very conscientious about my spending at it drives me a little mad sometimes. So I’ve started to work on freeing up that space in my head. That worrying space that doesn’t help me, it only creates fear and self-doubt. Thanks for the thoughts! Surrendering is such a relief. And often when we surrender, we discover that we don’t really want/need what we thought we were battling to begin with! Yes! so many of the things I always thought I needed have fallen to the wayside. What a nice feeling it is to know that you can have nice things, but at any moment you could let them go. They don’t define your happiness.